Check into your hotel. The rest of the day is free for you to make your way to visit the magical “floating city” of Venice. This evening, meet your Tour Director and fellow travelers. One of the most unique cities on Earth, Venice is a place of unmatched beauty and a feast of fantastic landmarks and iconic sites. 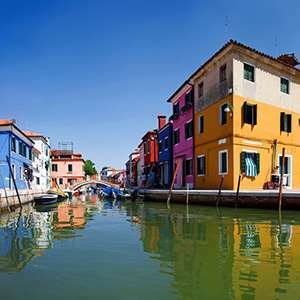 View the delightful criss-crossing canals, the gondolas, arched bridges, palaces, and piazzas. 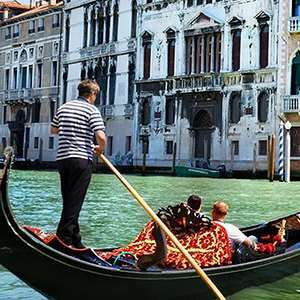 Your included orientation features a BOAT RIDE to St. Mark’s Square, and time at leisure for a chance to explore on your own or to join our optional gondola ride to enjoy the calli from a different perspective. You can also just relax with a cappuccino at one of the many cafés in the center. Bid arrivederci to Venice and cross into neighboring Slovenia. Discover the picturesque fishing village of Piran, with an enchanting medieval square lined with cafés. Continue to the spa town of Portorož (“Port of Roses”) for an overnight. Enjoy a free day to explore the pretty seaside resort on the Adriatic. You could pamper yourself at one of the wellness centers, or try your luck at a casino. Alternatively, we offer an optional excursion to the Istrian Peninsula, home to Porec with its beautiful beaches and Roman temple dedicated to Neptune, and to pretty Rovinj. Cross the border into Croatia, then relax and drink in the natural beauty of Opatija, a town nestled between the sparkling waters of the Adriatic and a lovely forest of bay laurels. Next stop is Zadar. Join your Local Guide and learn all about the historic Old Town with its exceptional cultural heritage, a treasury of archaeological and monumental riches of ancient and medieval times. Head into central Dalmatia and visit KRKA NATIONAL PARK, renowned for its breathtaking waterfalls and attractive water mills. Join your Local Guide to explore the outstanding natural beauty and home to more than 200 species of birds, be sure to watch for osprey, golden eagles, peregrine falcons, and Eurasian eagle-owls. Visit Trogir with its medieval walls, seaside promenade and maze-like marble streets. Continue to the vibrant port city of Split. The guided tour of Split reveals a city whose splendor dates back to the 4th century when Emperor Diocletian built his phenomenal palace—now a UNESCO World Heritage Site. Later, skirt the dramatic coastline as you make your way south to Dubrovnik. Along the way, stop in Ston, renowned for its defensive walls that were a major feat of medieval architecture. Awaken this morning in the “Pearl of the Adriatic,” one of the world’s most stunning cities, and discover Dubrovnik’s many charms in the company of a Local Guide. Game of Thrones fans should keep watch for filming sites used as King’s Landing and Qarth! Set off to discover some of the highlights of Montenegro. Kotor, situated in a secluded part of the Gulf of Kotor, is the deepest natural fjord in the Mediterranean. Your Local Guide will introduce you to this UNESCO World Heritage Site, including a short boat crossing to visit OUR LADY OF THE ROCKS, one of two islets off the coast. Return to Dubrovnik. Discover Croatia's incredible Istria Peninsula with its rolling hills and fertile plains. Visit the ancient Roman town of Porec, explore Istria's star attraction: coastal Rovinj and finally reach the town's iconic St. Euphemia. Spend an unforgettable day cruising around Kornati National Park, whose many shaped limestone islands, islets, and reefs make up a nautical paradise. 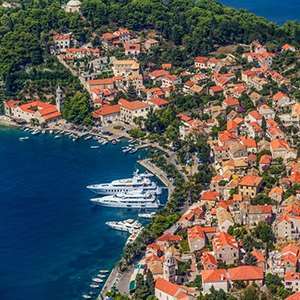 Discover the bounty and beauty of southern Croatia as you see the sights in pretty Cavtat and visit an old mill with a snack break featuring locally produced drinks and treats.